Lend your voice to the Covenant Choir, ring with the Covenant Handbells, play an instrument. Contact Matthew Garrett at mgarett@covenantweb.org to explore opportunities. The Church of the Covenant has maintained a long tradition of handbell choirs for over 50 years through the distinct sound of its British-made 5 octave White Chapel Handbells. 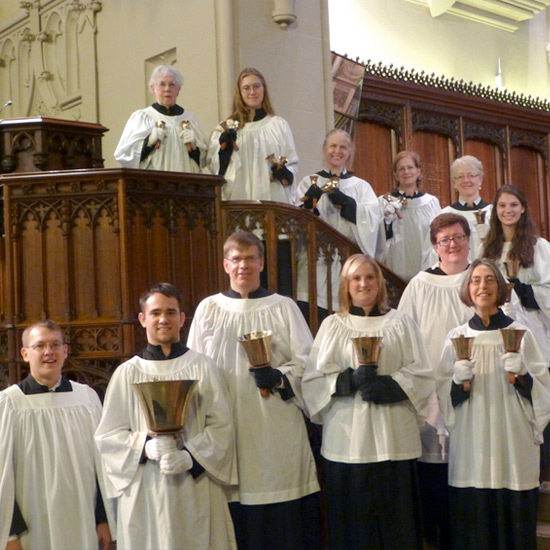 The Beckwith University Handbell Choir is comprised of college students and adults who rehearse on Thursday evenings at 6:30pm and perform regularly throughout the music season. Exposure to handbell ringing for children and youth is provided through the childrens choirs, and a special Youth Handbell Choir (9-12) occasionally plays in services. Prospective members should contact the music director about joining the ensemble. Prior experience in handbell ringing is not required except for a basic level of music reading ability.